Help make Sun Valley a better place to work, live, drive, and thrive! Our Regular meeting is held on the SECOND TUESDAY of EVERY MONTH, 6:30-8:30 PM. Calendar Page for other relevant events. Click to go to our I-5 Freight Corridor Information Page for important documents and information. Sun Valley Area Neighborhood Council Needs YOU to VOTE! Click to read about the candidates who are running. We are counting on you to VOTE! Come to Denny's on Vineland Blvd. near Strathern in Sun Valley on the first Tuesday of most months, from approximately 8AM-9AM. Meet your local Foothill Division Senior Lead Officers along with other local representatives. Everyone is welcome to stop by and address any questions or concerns in an informal environment. Sun Valley Business and Apartment Owners - are you still having RECYCLA/Trash Hauler issues? We are here to help. First, you MUST call RecycLA at 800-773-2489 to report your issue(s) and obtain a SERVICE REQUEST NUMBER. Then contact Cindy Sower at cindy.sower@svanc.com with the details and the service request number. It is absolutely necessary to obtain the service request number to enable us to track and document your issue. 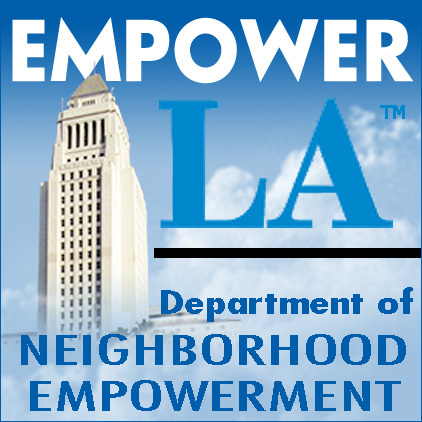 Neighborhood Councils were created through the 1999 Los Angeles City Charter reform package (Article IX) to promote citizen participation in government, better connect residents with their city government, and to make government more responsive to local needs. Neighborhood councils are direct links to our City Council and City governmental departments. 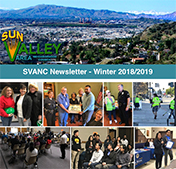 Neighborhood Councils are composed of volunteers from your community, elected by you, our stakeholders: those who live, work, own property or a business in Sun Valley. The Board consists of community stakeholders, just like you, who regularly meet to discuss and prepare presentations and address issues of needs and concerns of the local community and those affecting all of Los Angeles. Neighborhood Councils work as a locally accessible arm of the City, working together to influence decisions and accomplish common goals for the City and within our local neighborhoods ... where we live, work, play, shop, study, and raise our families. Additionally, Neighborhood Councils including the SVANC have Committees dedicated to specific concerns of the community and city, such as Beautification, Community Outreach, Planning & Land Use, Emergency Preparedness, etc. Anyone can attend these meetings. We need and encourage your participation -- whatever time and talent you can volunteer. Join your fellow neighbors at our next meeting. All meetings of the SVANC are open to stakeholders and interested parties. We are your community. Be part of your neighborhood council and help to change and empower our community. All for One - and One for All!